This week, a radio show in Boston aired a recording in which a Municipal Court Judge in Ohio recently sentenced a woman accused of leaving her dog in a filthy house to spend eight hours in a garbage dump. People are commending what the judge did; after all, the defendant did not act “humanely.” She abused the dog. And we don’t like that. Also this week, media were abuzz with the news that Walter Palmer, the Minnesota dentist who killed Cecil the lion and who faces extradition to Zimbabwe, had returned to work amidst protests and continued anger by many over Palmer’s killing of Cecil for no reason other than that he derived pleasure from doing so. He inflicted unnecessary suffering and death on Cecil. And we don’t like that. There is an endless stream of similar stories and the public reaction is almost always the same: we object to instances where people impose suffering or death of animals when there is no necessity. They abuse animals. And we don’t like that. Perhaps the most noteworthy example of this phenomenon involves football player Michael Vick, who, in 2007, was charged with operating a dog fighting operation. Despite Vick’s having spent time in prison and publicly acknowledging that what he did was wrong, many people still won’t forgive him. He inflicted suffering and death on those animals. And we don’t like that. The problem is that this “us/them” distinction—this idea that some of us are animal abusers and some of us are not—is based on outright hypocrisy. We’re all in the same boat. Let’s focus just on our most numerically significant use of animals—for food. We kill about 60 billion land animals every year, and an unknown but much larger number of aquatic animals, for food. If imposing suffering and death without necessity constitutes abuse, then all of those deaths constitute abuse and all of us who partake of those animals are abusers. Before you even think of saying that what we do is different from what they do because we need to use and kill animals for health reasons, let’s be clear: it’s not necessary to eat animal foods to maintain health. Mainstream professional organizations, including the Academy of Nutrition and Dietetics, the American Diabetes Association, the American Heart Association, the British Nutritional Foundation, the Dieticians Association of Australia, the Dieticians of Canada, and the Heart and Stroke Foundation; research and teaching institutions, including the Mayo Clinic, the UCLA Health Center, the University of Pennsylvania School of Medicine, and the University of Pittsburgh School of Medicine; government agencies, such as the British National Health Service and the United States Department of Agriculture; and even large managed care organizations, such as Kaiser Permanente, all acknowledge that a sound vegan diet is perfectly adequate for human health and some say that a vegan diet may even have significant health benefits. The best justification we have for imposing suffering and death on billions of animals every year is that they taste good. We enjoy the taste of meat, dairy, eggs, etc. We get palate pleasure from eating animal foods. And just how is that different from any other imposition of suffering and death by people like Walter Palmer, Michael Vick, or anyone else whom we label as an “abuser”? The answer is simple; it isn’t any different. Yes, there may be a psychological difference between someone who actually participates in killing animals and those who just go to the supermarket to buy animals someone else has killed. There may also be a psychological difference between the person who actually murders another human being and the person who paid an assassin to pull the trigger. But both are equally morally culpable and that is why the law considers them both to be guilty of murder. Any psychological difference between the Walter Palmer and the rest of us is irrelevant as far as morality is concerned. And it’s not just a matter of making sure that animals used for food are treated or killed “humanely.” Would anyone be less upset if Palmer had killed Cecil in a more “humane” way rather than letting him linger for a long while with Palmer’s arrow stuck into him? No, of course not. The concept of “humane” treatment has no application in the context of suffering and killing that is itself unnecessary. Unfortunately, many supposed “animal advocacy” organizations promote the idea that the “humane” use of animals for food is not only not objectionable but morally just fine. Just this week, the New York Times announced that McDonald’s will begin phasing out using eggs from hens who have been confined in conventional battery cages in favor of “aviary systems” that allow the birds some movement. McDonald’s estimates that it will take about 10 years to achieve a completely “cage-free” supply. The Humane Society of the United States (HSUS) and Mercy for Animals (MFA) are uncontrollably delighted about this. 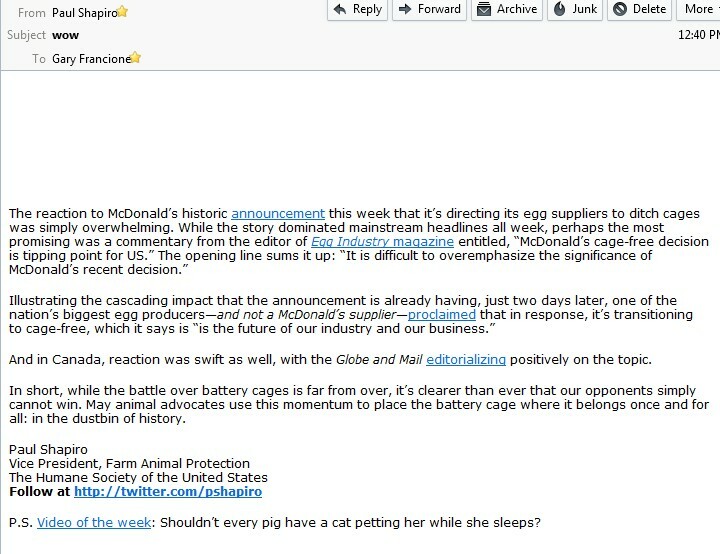 HSUS has declared this move to be a “watershed moment for animal welfare” and calling McDonald’s “admirable” and, in the words of HSUS CEO Wayne Pacelle, this results in the elimination of the “cruelest confinement from our food supply” at least as far as McDonald’s is concerned. MFA is claiming that its investigation of McDonald’s egg suppliers was responsible for the announcement. We applaud McDonald’s for its commitment to phasing out cruel cages in its North American egg supply chain,” said MFA’s president, Nathan Runkle. “It’s high time that McDonald’s acknowledged that cramming animals in cages barely larger than their bodies is inhumane and unethical. McDonald’s should continue this praiseworthy progress by adopting meaningful standards for chickens killed for Chicken McNuggets. You can help! Tell McDonald’s that chickens raised for meat deserve protections just like those raised for laying eggs. Once again, we see the us/them distinction: those businesses who use conventional eggs are abusers; those who use the “cage-free” eggs promoted by “animal advocates” are morally enlightened. We believe that is wrong. But “cage free” doesn’t necessarily mean much in terms of quality of life for hens. 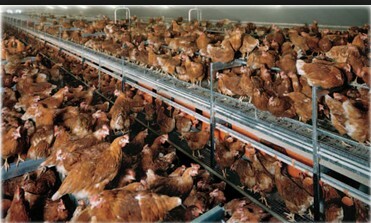 Eggs labeled “cage free” often come from hens packed side by side in massive sheds, Shapiro says. That’s right. That’s Paul before he went to work for HSUS. And that’s astonishing. Again: Wow. Second, once again, supposed “animal advocates” partner with the “happy” exploitation industry to make people feel more comfortable about continuing to participate in animal exploitation. They once again normalize animal exploitation by celebrating it. The enemies of slavery have hitherto ruined their cause by the senseless cry of gradual emancipation. It is marvellous that the wise and the good should have suffered themselves to have been imposed upon by this wily artifice of the slave holder, for with him must the project of gradual emancipation have first originated. The slave holder knew very well that his prey would be secure, so long as the abolitionists could be cajoled into a demand for gradual instead of immediate abolition. He knew very well that the contemplation of a gradual emancipation, would beget a gradual indifference to emancipation itself. And that is precisely what welfarists like HSUS and MFA are doing: they are working with institutional exploiters to normalize “happy” exploitation. In any event, the idea of “humane” exploitation of animals we use for food runs afoul of a moral principle that we purport to accept and that serves as the basis of our us/them distinction—that, whatever else we may believe about animal ethics, imposing suffering and death on animal in the absence of necessity or compulsion cannot be morally acceptable. The problem with the us/them distinction is that most of us end up being on the them side. If we believe that animals matter morally, we need to draw the line between those who eat, wear, and use nonhuman animals and thereby participate in and perpetuate the deliberate and intentional victimization of the vulnerable–animal slavery–and those who do not.